I have just visited an exhibition at The Curve gallery at the Barbican featuring the work of artist Celeste Boursier-Mougenot. 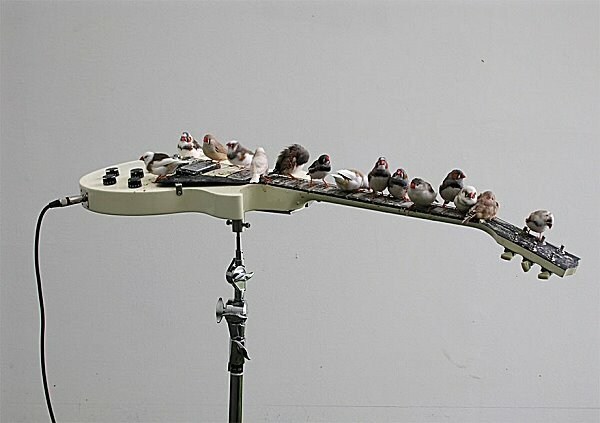 The show features a flock of zebra finches sharing the gallery space with electric guitars placed horizontal and face on stands. The birds fly around and perch on the guitar strings causing the sound to be amplified around the gallery. When I visited the exhibition I noticed that high up at the far end of the gallery the flat ledges over the rear exit were proving attractive to the finches. These ledges could have been used as a resting place for the birds providing a safe height and vantage point over the visitors below. However the ledges had been temporarily altered by the gallery; formed into a makeshift sloping arrangement to make it impossible for the birds to perch on them. Well almost impossible, a couple of birds were trying to cling on but after a few seconds would slide off, particularly if they moved at all. This sloping device and the covering of the ceiling lights and pipes with netting seemed a deliberate move to make sure that the birds provided the maximum entertainment for the viewers. With the ledges and ceilings impossible to use, this left just a series of small nesting boxes attached to the gallery walls for the birds to nest in. Again with sloping roofs these boxes did not provide enough nesting or perching space for all the finches in the gallery, resulting in the birds having to descend to the only other horizontal levels; the flat guitars. The pathetic attempts of the birds trying to build nests on a hard solid surface by intertwining blades of grass between the metal strings is presented here as art. This act was broadcast on youtube with the Barbican’s website telling us that it is ‘One of YouTube’s most watched clips of the month – Over 600,000 hits in just 4 weeks’. We are told on the exhibition handout that: ‘The zebra finches in this exhibition have been provided by a specialist in the supply of animals for artistic projects. The welfare of the birds has been carefully reviewed by the relevant authorities.’ I find it interesting here that the word ‘welfare’ has no bearing on whether the ethical issues have been reviewed, whether the birds are considered as beings with interests. If they are, then surely it is wrong to place them ‘away from their natural habitat and coerce them to make art for somebody else’. This is a quote from a random Internet blog I came across that was otherwise disinterested in either art or animal issues. I found it impossible to disagree or with the blogger’s succinct comments and unable to say anything more profound about the artwork. It seemed that once you agreed that these birds were out of their natural habitat and being put to work for the spectator’s enjoyment then any other critique or comments on the artistic value of the work could only be of secondary interest.